Glass roses are hand blown is incredibly intricate and detailed beautiful glass flowers. They can be made to stand individually or be included in one lavish bouquet. This glass is not really blown but the rose is built by shaping and heating solid glass over the flame. This process is known as lampworking. Follow the steps below to make your own glass roses. Make sure the ventilation system is turned on. Don the didymium glasses. Then, light the torch. With the glass rod measuring 10 mm, turn the top inch over the torch’s flame until molten. Take the glass off the fire. Position the glass in a down angle in such a manner that the glass would form teardrops shape. Circle the lowest part of the teardrop and the tip of the 8mm glass rod simultaneously on the flame. When both parts glow orange, touch both pieces together while continuing to rotate the pieces. The glass pieces that have connected must be pulled out of the heat, while continuing to turn the glass. Then carefully extend your hands such that you are pulling them apart. This will make a seamless connection. 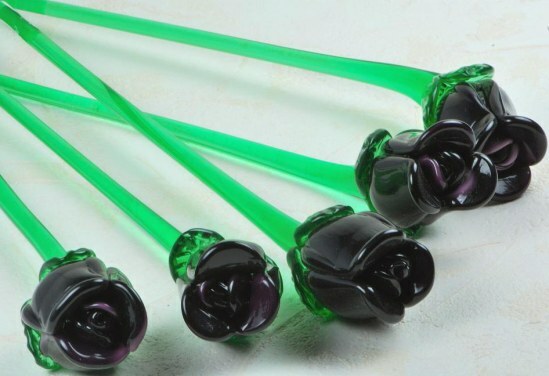 The shorter glass rod will act as the stem of the rose. The teardrop would be the flower’s bulk. Heat the tip of the teardrop. Then fire – cut or separate what is left of the longer (10 mm) glass rod. The tip that was newly separated must be heated until it is glowing. Pull this out from the fire. Swiftly grab hold of the heated tip using the tweezers. Twist this glass to construct the center and the top of the flower. The rose must be placed between the two pieces of blanket. This keeps the glass warm while you move on to the next step. Rotate the top most inch of a new 8 mm glass rod into the fire until the same glows orange. Take this off from the heat. Squeeze this material with the petal mashers. Hold the petal using the tweezers. Fire-cut this petal portion connected to said rod. Continue to repeat this step for about two times more. This should create three petals at least. Circle the top most half inch of the shorter 8 mm glass rod into the flame. When it glows orange, remove it from the fire. Squeeze this heated tip in between the leaf mashers. Then, separate this leaf from the glass rod. Continue to do this step depending on the leaves you want for your glass rose. Get the glass rose pressed between the blankets. Hold it by the stem. With tweezers, grab the petal. Heat a side of said petal and the rose’s base. Do both simultaneously. When the two glass pieces glow, take them off the fire. Touch said petal to the said rose. This will make for a connection that is solid. Attach what is left of the petals to the other open areas found on the flower’s base. With the tweezers, hold the leaf. Heat the leaf’s bottom part and the stem’s portion where you desire to attach the leaf. When both glow orange, remove them from the fire and touch both glass pieces to form a connection. Do this process for the remaining leaves. Check your leaf connections as well as your petal to ensure that all are properly attached to the flower. The connection should appear to be smooth without any obvious ridges. Should you find trouble spots, grasp the leaf or petal with the tweezers. Carefully heat the area connected until such time that the attachment is properly secure. Put the blown-glass flower in the kiln. Take it off when a complete kiln cycle has been finished. This usually takes about eight hours.